Yes, it is going to be the same for the ground reference frame, because variations in omega_ground are the inverse of variations in the tangential velocity along the cycloid, so the two cancel out precisely. I give up. I've explained that to you eight times now. You simply aren't capable of understanding the explanation. where do you see the constant omega after the cancellation of one v_mag? It is a clear description of you constantly moving the goalposts. Now, if the balls are mounted on frictionless bearings, they will not rotate with the wheel. They will still go through a circular motion, but they will not rotate themselves. And, of course, they will receive no rotational energy, because all parts of the ball have the same velocity and direction at any given moment. However, that is NOT the situation you have described previously. There they were fixed to the wheel. That there is some elasticity in the attachment does not make them less fixed. It may delay their acceleration a little bit, and there may be some oscillations during the acceleration phase, but at the end of the day they are going to move just as if they were welded to steel rods. You are just obfuscating, trying to make the setup unnecessarily complicated. I am not changing the goalposts. The idea of the experiment is the same from the beginning, to allow manifestation of the rotational kinetic energy. I disagree with the bold part. If some energy goes to rotation of the balls then there is less energy available to load the elastic rod springs therefore we would see a delta between different points on the cycloid. If we apply the same force, the same amount of energy for a short period of time dt on the ball then the ratio between the translational and rotational kinetic energy is a function of r.
No. The free-rotating balls will not receive rotational energy. *shrug* You posit a very elastic setup, but ANY construction is in principle elastic. The whole difference is in how fast it can apply energy. No. All energy comes through the rods. Also the rotational. (Where else do you imagine it comes from?). The string! Exactly like in the 'simple pendulum' example. The torque will come from the point where the string is attached to the ball. That's the question, how fast will string apply the rotational kinetic energy to the balls at different points on the cycloid. Last edited by SDG; 15th August 2018 at 11:33 AM. But it doesn't matter one bit. Whatever it is, it transfers the energy. Last edited by MRC_Hans; 15th August 2018 at 11:34 AM. The string is there from the beginning. It does matter. That's the whole point that the balls behave like pendulums with different radius of the curvature. That's how this experiment is linked the the 'simple pendulum' issue, the first post of the other forum thread. The whole difference is in how fast it can apply energy. This is the question: at what rate the energy is being applied to the balls rotational kinetic energy along the cycloid where \omega_ground varies? Hans, you're wasting your time. There's an irreducible delusion in effect here; SDG is unable to consider the possibility that the rate of acceleration of a ball attached to a wheel is independent of frame of reference. There's nothing anyone can say to convince him otherwise. At the same rate as the wheel rotation. There may be fluctuations, but on average they can only go with the same speed as the whole wheel. This can all be analysed mathematically with no need for an experiment. If you correctly determine the expression for ds/dt, the rate at which the ball traverses the cycloid, you will find that it is the inverse of omega, the rate of curvature of the cycloid, and that therefore the product of the two is constant. I showed you \omega_ground equation. Your turn to show how it is constant, please. The fluctuations are important in this analysis. We have a tiny dt applying the force on the balls, creating a fluctuation. Can we prove beyond any doubt that the fluctuations are the same in points B, L and T? I do not think they are the same because we have different r for those points in the ground reference frame and therefore different amounts of rotational kinetic energy 'entering' the balls. No. I've had enough of this stupid game you're playing. Because you cannot show it. You made a mistake. Learn what credible sources are. Credibility in science has an order, e.g. textbooks, papers, scientific web pages and blogs, forum posts with references. Learn your subject matter so that you can recognize credible sources or cranks. Look up the authors to see if they are credible or cranks. Read the context of your source (a "The Electromagnetic Nature Of Things" blog writing about gravity!). That GR works is documented fact. Tests of general relativity. During 100 years of testing GR has passed every test that has been thrown at it. Yet another link to that crank web site, SDG. Textbooks... it was pointed out in this thread how the 'simple pendulum' is not treated in a clean way in the textbooks. The Equivalence principle in GR is based on some thought out 'uniform gravitational acceleration' being equal to the straight line linear acceleration. The uniform gravitational acceleration is just a model, unrealistic stuff. It is missing the "Reality Check". I am sorry, I could not resist. ... all in a good light humor. This thread points out and exploits the fact of the linear acceleration not being equal to the curvilinear acceleration in reality, no fiction. 1) Which points are you referring to? ... No I'm not going back in the thread trying to guess which link to some drawing you are referring to. SHOW YOUR REFERENCE directly in the post. 2) What are the conditions? Gravity? Air resistance? Resonances? Friction losses? Finally, I have highlighted a few words in your post: Who are this "we" you are referring to? Nobody here owes you proof of anything. YOU are making a claim, YOU have the burden of evidence. Do you really think we are going to get dragged around in ever more strange scenarios, chasing your racing goalposts, just to convince YOU that GR is correct? I'm sorry, but we are to experienced for that. If you want to convince anybody that GR is wrong, you have work to do, and we ain't doing it for you. And I think this is what he's on about. ETA: SDG is this your website? Then you really should have a Figure 18 to show the reader how you think the pendulum rotates and proves your Eq. 23. Last edited by Elagabalus; 16th August 2018 at 02:00 PM. Given that this is paradigm changing, Nobel worthy stuff, one wonders why it is on a blog. Let's be honest, one might as well link to Thunderdolts.misinfo as an argument. I'm not having a go at Elagabalus, but if this is the extent of the 'evidence' against relativity, then it deserves no discussion. There are numerous crank journals spewing out 'Einstein was wrong' garbage. Pay-to-publish, usually. Too many cranks out there, all suffering from Dunning-Kruger syndrome. This thread should quietly die. If anybody has anything to say about GR/ SR, then let them publish it in a proper journal. Last edited by jonesdave116; 16th August 2018 at 02:09 PM. I wrote about credibility of sources. You are showing gullibility by citing a crank web site and forum posts. There are better, more credible sources. The rest of this post suggests ignorance about the subject. The equivalence is not equal acceleration, it is equivalence of gravitational and inertial mass (Newton) + force equal to pseudo-force (Einstein). Physically, gravitational fields such as the Earth's are uniform on small scales. At the surface of the Earth, locally the gravitational field is uniform. You do not have to worry about tidal effects tearing you apart because the gravitational field is higher at your feet then your head ! A local uniform gravitational field is a realistic condition in the principle. GR is derived from the equivalence principle. N.B. "The outcome of any local non-gravitational experiment in a freely falling laboratory is independent of the velocity of the laboratory and its location in spacetime." Is a pendulum a non-gravitational experiment, SDK? Last edited by Reality Check; 16th August 2018 at 02:32 PM. I hope that I wasn't giving the impression that I believe SDG's takedown of GR. It's just that I found his set up for his "thought experiment" rather opaque. Perhaps. Then I can say for certain that, provided the train is moving in a straight line at constant speed, all parts of the wheel will behave in the same way regardless of the velocity of the train (including the velocity zero). That has fascinated me from the start, too. Here we have some guys believing that they can topple GR merely by thought experiment, showing inconsistencies in the equations. I can only say, get this formalized, and if the math is solid, surely it will be accepted in a real physics journal. The Nobel prize should be yours twenty years later. I'll repeat the description of the experiment. There is a well balanced wheel, no resonance. The plane of the wheel is horizontal, the axle of the wheel points to the center of the Earth. Gravity is 90 degrees to the motion at every point along the trajectory, no influence. The wheel is firmly attached to a train car that moves at a constant velocity. We will observe the rotation and acceleration of the rotation from two frames, moving reference frame from within the train car and from the ground reference frame. The wheel has steel balls seated on elastic rods at positions BLT, please see the image. There are friction less bearings between the rods and the balls. The balls are attached to the axle with a non-elastic strings. We have a capability to make the rods rigid, bring the balls to any angular velocity and then make them elastic again so we can observe a rotational acceleration at different velocities. Before I go further, any questions, concerns so far? Mmm, there is the question of air resistance, but otherwise, I find the set-up well described. Since the set-up assumes parameters that are not obtainable in the real world (e.g. friction-less bearings), I assume this will be a purely mathematical exercise, and I will be willing to accept that air resistance is ignored. So now, what is your claim? Your claim should include a sequence of actions, and their claimed outcome. The rods are the green bit in the inset image (which should be labeled side view)? Are the rods axles i.e. do the rods go through the balls? Or the balls just sit on the rods? If the balls are attached to the axle with a non-elastic strings why not call them spokes? It would be less confusing even if they're labeled spokes with string like behavior. When you say rods here you mean the green bit in the inset image? Just to be clear. The air resistance can be ignored, it is like gravity, the same at every point along the trajectory. The analysis is coming, I need to prepare some diagrams. The balls sit in an 'friction less' bearings, meaning the rods cannot give any torque to the balls. 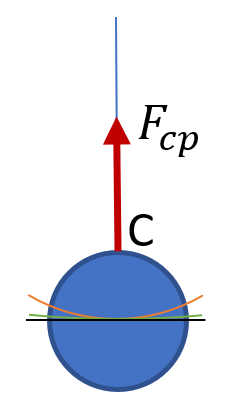 The torque would come only from the connection point 'C' between the ball and the string. Spokes are rigid, they can bend, energy goes to bending, this would add complexity, it is not wanted. Just limiting balls from flying away. There is another issue related to this, but I leave it for later. All depends on how accurate you want to be. For instance, if those little green rods bend in the process, gravity will play a role. However, I suggest you start by specifying your claim. That I and others have said we understand you setup is not the same as accepting that it is useful for providing evidence for your claim. Let us define a steady state. The train is at constant 1m/s velocity moving in a straight line. The radius to the center of the balls from the axle is 1m. The wheel is at constant angular velocity 0.5rad/s. F_cp is the centripetal force, it is the same for every ball and it is the same for both reference frames. Let us accelerate the rotation of the wheel to 0.6rad/s. F_l is caused by the inertia of the balls. It is a loading force, loading the 'springs' of elastic rods. Now we stop acceleration of the wheel and the balls will catch up. F_r is a release force of the elastic rods when the rotational acceleration is stopped. If we consider some damping in the elastic rods then the balls will stop in the steady state at 0.6rad/s after a couple of oscillations. This is based on the acceleration analysis, keeping the conservation of angular momentum in mind as well. This analysis will yield the same results for all balls in both reference frames. Do we have an agreement? Beauty lies in the eye of the beholder, trust me, the relativity is beautiful. I like it! I have very specific questions. 1). Can the balls rotate around the edge of this wheel? Meaning B can run into either L or T.
2). Your picture shows 3 balls resting on green rods. Are there only 3 rods on the edge of the wheel? Are the rods in a fixed position? 3). Your picture shows balls raised above the top of our wheel. Your description mentions that the balls are resting on bearings that are on top of the rods. What happens when the ball falls off the green rod? There may be other questions later. 1) No the rods are rigidly attached to the wheel. I called this points on the wheel BA, LA, TA earlier in the thread. Meaning B cannot run into the other balls. 2) We could have many more balls and rods equally spaced around the wheel. I chose only B, L, T, because the curvature/radius are obviously different in these points. This is for demonstration purpose. The rods are in a fixed position in relation to the wheel. 3) If a ball falls of the rod then it means we 'pushed' the experiment too far and the experiment failed. You keep mixing speeds and accelerations, it's confusing. On the same line you mention omega, and 'acceleration on a circle' .. what does that mean ? Is the wheel spinning, standing, or accelerating in rotation ? Right, there is no d\omega/dt in this case. What I have in mind is constant \omega and centripetal acceleration. What centripetal acceleration there would be on a circle based on radius, \omega parameters? Notice how the radius/circle/equipotential line splits the ball into to parts that are not equal for 1m and 100m radii. How is this related to the centripetal force? No. I asked you to state you claim before starting to describe your experiment. 1) You can't adapt your claim to whatever outcome the experiment has. 2) It gives your reviewers (in this case other posters here) an opportunity to see if the proposed experiment seems suitable to support your claim. Instead, you started to describe an experiment, but did not state your claim. I will not spend time assessing your experiment till I know its purposes. a) "Some damping"? How does that function? How can you avoid that this has an effect on the outcome? b) "Both reference frames"? Which are those? A attempt to analyze what looks like an ever changing physics example, is not an experiment. You have to run an actual experiment to verify or falsify the Einstein equivalence principle. And, as you know, that has been done. Thus the thread is nothing to do with GR. If you state the physics problems clearly once and forever then people may be kind enough to help you solve it. The proposed experiment leads to detection of straight line constant linear motion from within a moving reference frame without any signal from the outside. The conservation of energy analysis leads to different acceleration predictions between the ground and moving reference frames. Only one acceleration prediction can be true. I know it is a loose definition but I hope it is good enough for now. a) The damping is the same in all rods when rods are exposed to the same experimental conditions. For example when rods are next to each other, not moving, loaded with the same energy in the balls, the balls will oscillate in unison till they stop at the same time. b) The ground and the moving/train reference frames. It is not only free falling experiments that are related to the Equivalence principle according to this Feynman paragraph. The idea here is that there is no force acting on the train car (other than gravity - equal in the plane of the experiment and 90 degrees to the rotation) so we are not supposed to detect straight line constant motion. Last edited by SDG; 19th August 2018 at 02:24 PM. #2 is contradictory. B, L, and T are "obviously" different in these points, but the rods are in a fixed position. Your picture that you selected do not show different rod lengths.